Yes, There's A Summer Camp Dedicated To Learning About North Korea : Parallels On a beach resort in southern South Korea, the government sponsors camps each year where kids as young as 11 are taught about North Koreans, to prepare for a peaceful "reunification" — one day. 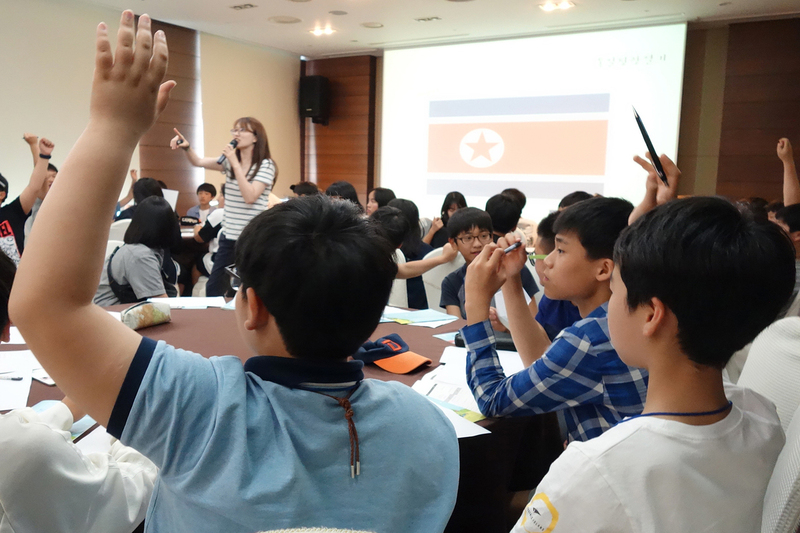 The eighth and ninth graders at a recent Unification Leader Camp in Jeju, South Korea, answer questions about their knowledge of their neighbors to the North. There's a summer camp on every theme these days, even North Korea. South Korea's twist on extracurricular enrichment is called Unification Leaders Camp, and it's a government-sponsored getaway dedicated to schooling South Korean youngsters about their neighbors to the north. At a recent camp session on South Korea's Jeju Island, 120 ninth-graders rolled their suitcases into a sprawling beach-side resort lined with palm trees, snapping selfies on the resort lawn. It was the last they'd see of the outdoors for two days. After check-in the students were ushered inside a hotel banquet room where they quizzed North Korean defectors about life in a country that South Koreans aren't allowed to visit, or even call. "I'm excited, just excited," says camper Eunha Park, a 16-year-old from Seongnam, in Korea's Gyeonggi province. Like the other campers, she's grown up with the idea that the two Koreas should reunite. Despite 70 years of post-Korean War tensions, the goal of reconciling the two Koreas has never been abandoned. "It's widely known that [unification] is necessary and important, but I think I'm worried because there seems to be no prospects," Park says. That's why the South Korean government's official Unification Ministry exists. One of its charges? Keeping unification hopes alive among the younger generations. In a group exercise at Unification Leader Camp, students are challenged to come up with ways to show the idea of unification with their bodies. "As time goes on, the awareness about unification becomes weaker. We need these camps to help the kids think about being leaders in unification one day," says Sung Chan-young, a manager from the ministry who's in Jeju to observe. The government has put on these camps across South Korea since 2012. They reach about 4,300 students — as young as 11-years old — each year. At the start of this two-day session down by the beach, kids open up by sharing their notions of the North. Sixteen-year-old Kang Dawon offers "defectors, dictatorship and spies." She adds that she thinks that North Korean spies would be very handsome. Over the course of camp, the kids make jewelry pieces called "unification bracelets of hope," hear lectures about North Korean policy and make their own music video versions of a government-sponsored unification song — "One World One Korea." It's a "We are the World," of sorts, for the Koreas. Despite ongoing talk of reconciliation, lately the relationship between North and South has only become more estranged. Cooperation at the top government levels has been cut off in response to the North's nuclear tests. But the unification camps continue, encouraging a notion of ethnic brotherhood. "So in the big picture, there is this dualistic structure. That's what we tell the kids," the Unification Ministry's Sung says. Which means these kid campers have to balance the same paradox faced by South Korean policy makers. How can they imagine unifying with a North Korea from which they're increasingly isolated? And even if the kids' curiosity is piqued at camp, all South Koreans are prevented by their own government from checking out North Korean materials or reading North Korea's news outlets online. Even a British site that explores what technology is like in North Korea has been blocked. "It is really a pretty serious contradiction that does exist there," says Sarah Son, a North Korea researcher at the School of Oriental and African Studies at the University of London. She says the contradiction is part of the South Korean state seeing itself as a parent to the people. "There's just this sense they want to keep the story safe, they want to keep it secure, they want to keep it within tightly-controlled realms," Son says. One such realm is camp itself. Despite the beach so close you can smell the salty air, none of the camp takes place outdoors. The entire program happens inside the one carpeted banquet room that could be anywhere in Korea, or the world. The windows are covered with blackout shades. Much like South Korea's hopes for unification, exploring the idea has limits. A previous version of this story said children as young as age 5 attend the camps. The youngest kids are in fifth grade, not 5 years old.